Here’s a children’s book that not every young child will read, but having read it, I feel compelled to give it a place in the list of great children’s books. For sure, it is for an older child, about 12. It has both a girl and boy as the main characters so both genders could relate to it. 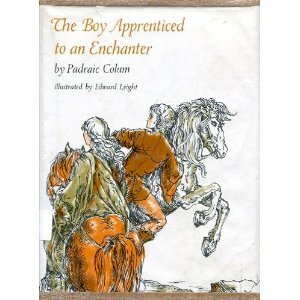 And it is by a superb Irish storyteller, Padraic Colum, whose book, The King of Ireland’s Son, is perhaps his best known work. When I first began the book, I was uncertain if I would stay with it. The language is somewhat archaic to our modern, and especially American, ears. However, by the time I finished the first part of the three-part book, I was ready to see what happened next. And by the time I reached the concluding section, The Two Enchanters, I was quite glad I did. This children’s book is pure adventure, from start to finish, fantastical and far removed from any daily life experience one might have ever, whether today or in the olden days. Therein lies its charm: It is pure fantasy writing, but mixed with historical information that grounds the book into a time and place that one could imagine really existing.